This is Living Wage Week, another opportunity to promote the benefits of the real living wage and fair work more widely. The week traditionally starts with the announcement of the new Living Wage rates, which this year have increased to £9 per hour and £10.55 in London. The Resolution Foundation has published a briefing on how the rate was calculated this year. Wider inflation was obviously a key factor in the increase. In addition, some policy changes act as a downward pressure on the rates, for instance, the increase in the personal tax allowance and additional childcare support. Other policy changes create upward pressure including the ongoing freeze in working-age benefits. I was at the Living Wage Expo at the Tynecastle Stadium in Edinburgh yesterday. 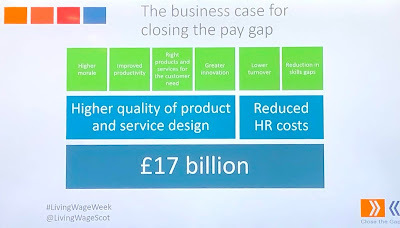 Peter Kelly from the Poverty Alliance reminded the audience of how much progress had been made with the Scottish Living Wage - £216m into workers pockets, 34,000 workers getting a pay rise and more than 1300 accredited employers. We should also remember that many other workers have benefitted outwith accredited employers, due to procurement and collective bargaining. It was good to see a public sector employer (even if they try to hide the fact! ), Scottish Water Business Stream, getting the employee choice award. The nomination included a positive statement from a worker who explained what fair wages meant to them and how it changed their perception of the employer. This theme continued with a panel discussion involving Heart of Midlothian FC staff. They all described how the living wage meant they could afford what most of us regard as essentials, like holidays, transport etc. 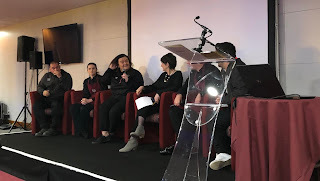 One young worker in the hospitality department highlighted the difference between £5.90 on the age-related minimum wage and £9 on the real living wage. The motivation of these workers was very apparent. Well done Hearts - time for other football clubs to follow! 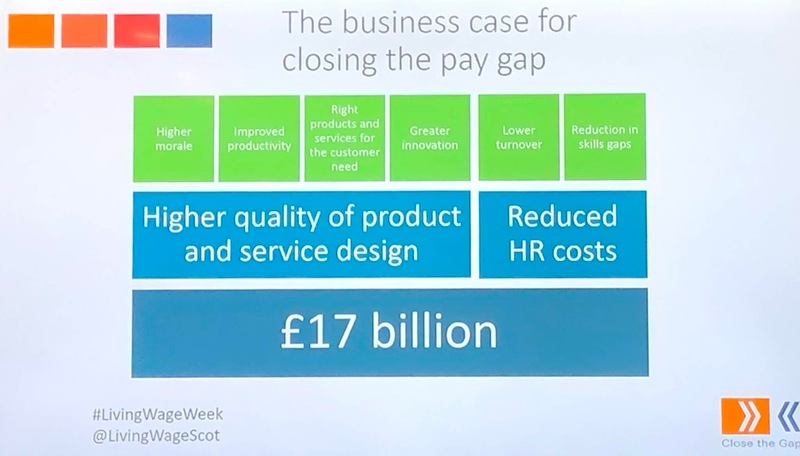 The Minister for Business, Fair Work and Skills, Jamie Hepburn MSP set out the Scottish Government's aim of making Scotland a Fair Work nation. He rightly made the point that more equal societies do better on all tests, not just economically. He accepted that Scotland could do more as there are still one in five employees who are not yet receiving the living wage. I would point him to procurement, where policy has not always been matched by best practice. The Outstanding Leadership Award went to Standard Life Aberdeen, who I would agree have been real private sector champions, not just with the living wage. They make the business case for the living wage, and in their sector, the wider benefits of trust and how it is a good measurement of company behaviour. The living wage isn't just about big employers. One of the real successes of the living wage movement in Scotland has been the engagement from hundreds of small companies. Sarah Roberts from Healthy Nibbles is a good example of such a company and she set out the benefits for her firm and their workers. Importantly she emphasised the wider fair work agenda of her business. Other SMEs that have become accredited employers this year and were recognised in the awards as well. As women are disproportionately represented in low pay workplaces, the living wage is also important in closing Scotland's gender pay gap. Anna Ritchie from Close the Gap pointed to the similarities in the business case for tackling the gender pay gap and the living wage. Tess Lanning from the Living Wage Foundation reminded us that the living wage campaign started as a community campaign. 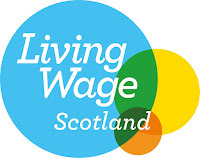 This is something the campaign in Scotland is seeking to build on with the living wage place initiative. Including outsourced workers has also been important to the campaign, which has encouraged innovation in the workplace and extended the living wage beyond the core workforce. A good example is South Lanarkshire Council, who won the anchor institution award. They have increased the percentage of the workforce across the council area who are paid the living wage using the levers available to every local authority. I would also highlight North Ayrshire Council who were quick off the mark to commit to paying the new rate this week. Dave Moxham from the STUC made the point that voluntary initiatives like the living wage are important in delivering real benefits to workers and promoting a different economic model. It supports the campaign for a higher statutory minimum wage and abolishing the age-related rates. Richard Leonard reiterated Scottish Labour’s commitment to a £10 per hour minimum wage this week. Finally, I was very honoured to receive the Lifetime Achievement Award. 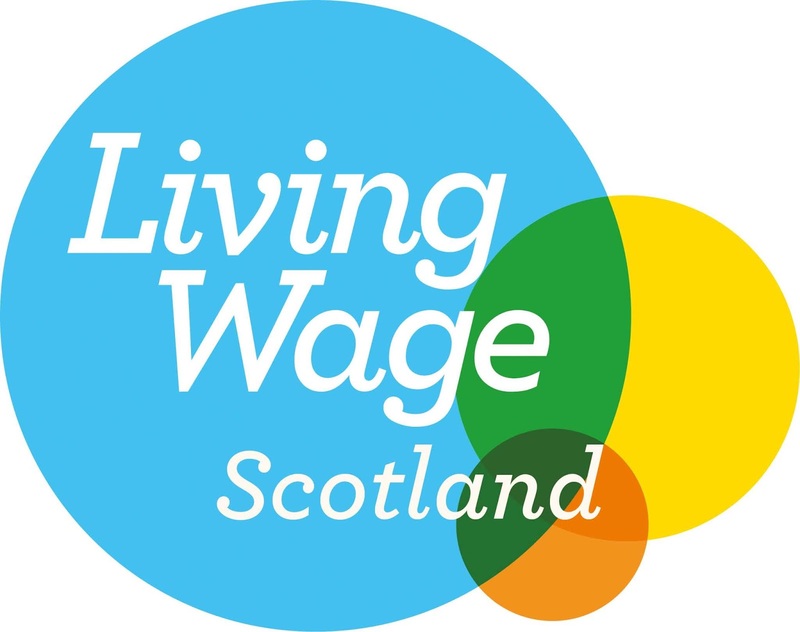 It does seem like a lifetime since we kicked off the living wage campaign in Scotland, but actually, a lot has been achieved in a short time. Like others, I have burnt out a few PowerPoint projector bulbs pitching the case, but my role has often been to tear down fallacious legal barriers and find ways around EU and other procurement rules. There is still a lot to do, but the campaign is in good hands.